With the warm weather finally making its way to Michigan, we find ourselves actively engaged across the globe. With so much happening, make sure you are keeping up with us on Facebook! We make sure to put all the good stuff there to keep everyone up-to-date between Wolverine Guards. Here is a snapshot of two key Michigan National Guard events this summer. EXportable Combat Training Capability (XCTC) is an instrumental battalion field training exercise designed to certify company proficiency in coordination with First Army. The July XCTC exercise at Camp Grayling will mark the very first time in history that National Guard and active Army forces have certified proficiency together. Stay tuned in the July Wolverine Guard for more information. We will also be updating the latest information on our Facebook page. In one of the most comprehensive displays of military might in the modern history of the Great Lakes region, Operation Northern Strike will bring together Soldiers, Airmen and other military personnel for two weeks of intense operational training at locations across northern Michigan in August. This fast-paced, action packed exercise will be covered in greater detail in our August and September Wolverine Guard editions. We will also be following it live via our Facebook page! Our ability to handle change, both as individuals and as an organization is a major reason we are the premier military in the world. When faced with uncertainties on the battlefield or in the air, U.S. military forces adapt, overcome and are ultimately successful because we welcome change and harness it to our advantage. Much of the uncertainty which we have been faced with recently is not generated by our adversaries. Instead, shrinking defense budgets and questions regarding the relative roles of active duty, National Guard and Reserve forces cause us to question what our military will look like in the future. At a recent conference which I attended, there was a discussion on how to minimize the undesired effects of this uncertainty and change on our members and organization. There were many ideas presented but one in particular resonated with me. The basic premise is that most of us are resistant to change because we assume that it’s negative. This belief ignores the fact that in many cases, there are significant advantages in overcoming organizational inertia and accepting and embracing a specific change. In short, our attitude towards change, whether planned or unplanned, is what ultimately determines how successful we are. So, what can we do to accept change and be successful in a fluid environment? First, set the proper expectation or attitude regarding the proposed changes. In other words, have an open mind and look at the proposed changes as opportunities instead of threats. Don’t assume that you or the organization will be adversely impacted. Try to identify the positive outcomes that are possible and communicate them to your colleagues. Have an active and transparent dialogue about how the proposed changes will affect the organization and plan for them. A positive mindset is the first step in conquering change. Secondly, determine what you need to do to be successful. Many times, we are guilty of being indecisive and stagnant because of the mere possibility of change in the future. Instead, work on the facets of your personal or organizational readiness that are independent of any changes. Determine what you can control and focus your efforts on those areas. Get back to basics with your service Core Values. Integrity, Service, and Excellence are always useful reminders about what is important to concentrate on. Build a strong team that does the right things in the proper way. Develop a personal or organizational strategic plan. In short, craft a flexible and agile team that will be ready for the challenges of the future. Finally, accept that change is an inevitable and required aspect of making an already outstanding organization even better. Where would we be as a military if we employed tactics and procedures from the “old days” without looking for a better way? Would we rather be Google or CompuServe? Apple or Blackberry? How did those great companies get to where they are? The National Guard’s ability to innovate is a force multiplier. We have always accomplished more with less. We are the oldest military organization in the United States. Our ability to provide more national defense value compared to active duty forces is unmatched. We aren’t going anywhere! ZACAPA, Guatemala — Approximately 74 Soldiers from the Michigan National Guard’s Marquette-based 1430th and the Sault Ste. Marie-based 1437thengineer companies traveled to Guatemala to participate in Beyond the Horizon 2014. Beyond the Horizon is a joint, interagency combined field training exercise consisting of humanitarian and civil assistance construction projects, medical readiness, training exercises and other construction projects. During the two-week mission, Soldiers trained on their engineer skills to include masonry, carpentry, electrical work, plumbing and excavating. By building schools and clinics for the local communities of Zacapa, Guatemala, the Soldiers applied their military skill set in a real world mission. 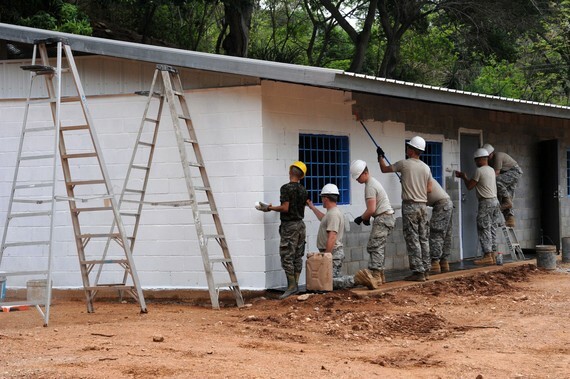 The Michigan Soldiers worked side-by-side Guatemalan Army engineers to learn skills and new ways of doing things while helping the Guatemalans build much needed buildings for their communities. There were definitely challenges in the mission, not the least of which being the language barrier. Few of the Soldiers spoke Spanish and, though there was always an interpreter on each site, the Soldiers needed to pick up key Spanish phrases quickly to accomplish the construction missions. 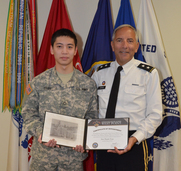 Staff Sgt A.J. McLarahmore, with the 1437th Engineer Company, carried a notebook everywhere with him and kept notes on new Spanish words he learned for reference each day while working with the Guatemalans. For many of the Soldiers, this was their first experience with an exercise like this. “To help other people is awesome, I would do it every day if I could”, said 1430th Engineer Company 1st Sgt. Dewayne Ward. Another challenge the Soldiers had to deal with was the weather. Temperatures exceeded 100 degrees most days, so preventing heat-related injuries and sunburn were top medical concerns. For the Upper Peninsula Soldiers, many of whom had snow on the ground when they left Michigan, this was a monumental adjustment. Many Soldiers were able to cross train in other skills, doing whatever job needed done to keep the projects on schedule. Spc. Krystal Tucker, with the 1430th Engineer Company, is an electrician by trade, but spent a good deal of her time doing block work. One particular project called for the Soldiers to replace a run-down school with a brand new building. The school children requested the Soldiers build them some playground equipment, though that was not in the initial building plans or budget. Not wanting to disappoint the children, Staff Sgt. Andy Kabelman, with the 1437th Engineer Company, said he would see what he could do for the kids. With the help of his fellow Soldiers and leftover building materials, he built the children a playhouse, complete with monkey bars and seesaws. Some of the Soldiers even chipped in their own money to add a slide. “The look on the teachers’ and children’s faces when we unveiled their surprise was more than enough satisfaction for me,” said Kableman. The mission was a resounding success. Soldiers were able to improve on their skills in a real-world environment while providing necessary infrastructure improvements for people in need in our partner countries. For more photos, check out http://minationalguard.com/beyond-horizon-2014/. LIELVARDE, Latvia — Latvian and Michigan National Guard Soldiers work together to launch the historic first Unmanned Aerial Vehicle flight into the Baltic skies at Lielvarde Air Base on the afternoon of May 15, 2014. 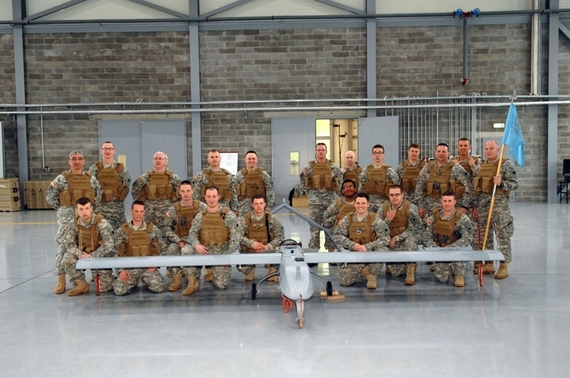 Latvian Armed Forces, providing aviation tower and runway support, assisted with the first flight of the RQ-7 Shadow Unmanned Aerial Surveillance aircraft by the Michigan Army National Guard Unmanned Aerial Surveillance platoon, B Company, Brigade Special Troops Battalion, 37th Infantry Brigade Combat Team, Military Intelligence Company (MICO). Prior to launching the aircraft, members of the Latvian MOD staff were shown the control shelters. The operators and mission payload specialists fly the Shadow aircraft from the Humvee mounted shelters. “We have brought the aircraft to Latvia to integrate them into your training. This means that your soldiers will be able to use the video to see what the aircraft sees. Your intelligence officers will be able to send unmanned aircraft to a place on the battlefield and see what the situation is there,” said Lt. Col. Andrew Roberts of the Michigan Air National Guard. Roberts went on to point out that the Shadow is more than a military resource. He explained how the aircraft may be used in a civil crisis situation where there is a natural disaster and it would jeopardize lives to send in a live person. He also explained how these training opportunities allow for both armies to fully realize the potential of the system. The UAV platoon launched two aircraft Thursday and tested both control and launcher equipment, showing both systems to be mission ready. The successful flights have confirmed that the Shadow platoon will be able to perform its mission, supporting exercises Namejs, Flaming Sword and Saber Strike Exercise 14. These training exercises are a continuation of the 22 year state partnership between Michigan and the Republic of Latvia. For more news and photos from Saber Strike, check out http://minationalguard.com/saber-strike/. Outdoor activities are popular during warm weather, but physical injuries can put you or your Family members on the sidelines during the fun. According to the U.S. Army Public Health Command, musculoskeletal injuries are a leading contributor to the estimated 25 million limited duty days logged in the Army during an average year. Many of those injuries occur during physical training or while participating in sports. Fortunately, preventing sports and PT injuries is relatively easy — all it takes is proper planning. • Always warm up and cool down before and after physical activity. • Although some muscle soreness is expected following physical activity, pushing yourself too hard can aggravate injuries. • Activities should be age appropriate. There are many ways to exercise outdoors; plan ahead so everyone in your group can participate in an activity suitable for their age and fitness level. • Provide water for pets coming along for the fun. Proper footwear plays a key role in injury prevention. Keep the following tips in mind when choosing shoes. • Shoe selection should be tailored to your particular foot type. • The arch of your foot will help determine the type of shoe you should purchase. High arches need cushioned shoes; stability shoes are appropriate for normal arches; and motion control shoes are the best fit for low or no arches. • Always tie and untie shoes when putting them on and taking them off. • Shoes should be comfortable when you try them on. If they aren’t, don’t buy them. • Replace running shoes when they begin to show visible wear or after 500 miles, whichever occurs first. • The best shoe for you may not be the most expensive. Always try on both shoes in the pair you’re considering and walk around the store before purchasing to ensure proper fit. • If possible, shop for shoes at the end of the day to accommodate foot swelling. Proper clothing can help prevent injuries and keep you safe by heightening your visibility to motorists and protecting against the sun’s harmful rays. Remember these tips when shopping for exercise clothing. • Select items that include reflective material if you’ll be running or exercising outdoors during times of low or limited visibility. • Items should be comfortable, light in color and fit loosely. • Never wear rubberized or plastic suits during outdoor activities. • Find an alternate indoors location when the weather is extremely hot. • Avoid activities near heavily traveled streets and highways during peak traffic hours. • Avoid exposure to tobacco and other pollutants before and during exercise. • Exercise early in the day or during the late evening if your area has a problem with smog. • Use waterproof or sweat proof sunscreen when exercising. For additional information on exercise safety, visit https://safety.army.mil.